Does speaking correct English give you confidence and make you happy? 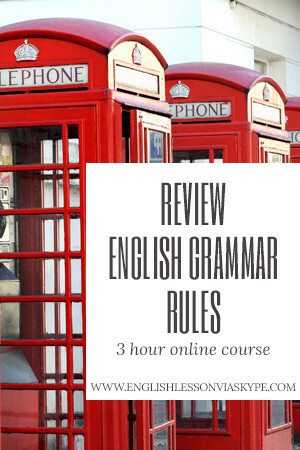 Well, then this 3 hour English Grammar Rules Revision online English course is for you. My course is aimed at upper-beginner and intermediate English students who want to speak fluent English. In my English Grammar Refresher Course you will start with reviewing Simple English Grammar Tenses, continue with a detailed review of the Present Perfect and then move on to the use of articles and prepositions in English Grammar, and much more … and don’t forget about quizzes. Can you believe it? Why do you need to enrol in my English Grammar Course? 1. What will I learn in your english grammar video course? 2. How to talk about the Present in english? 3. How to talk about the future in english? 4. How to talk about past events and experiences in English? 5. how to use the present perfect tense in english? How long will I have access to the english grammar course? Who should take this grammar course & what tools are required? What will I be able to do after completing your english grammar course?